Solomon Endeshaw is a 9 year old boy that has enough energy for five little boys. He is very curious so that makes him even more active. He wants to know how everything works, why things are a certain way, and if he can play with it. Solomon doesn’t know much English but he is great at miming his questions when he speaks to missionaries. Solomon’s dad died a few years ago and he left behind land that was Solomon’s inheritance. But the extended family chased Solomon, his mother, and his siblings out of town because they wanted the land for themselves. Solomon’s mother is very sick so she could not fight the family for Solomon’s inheritance. 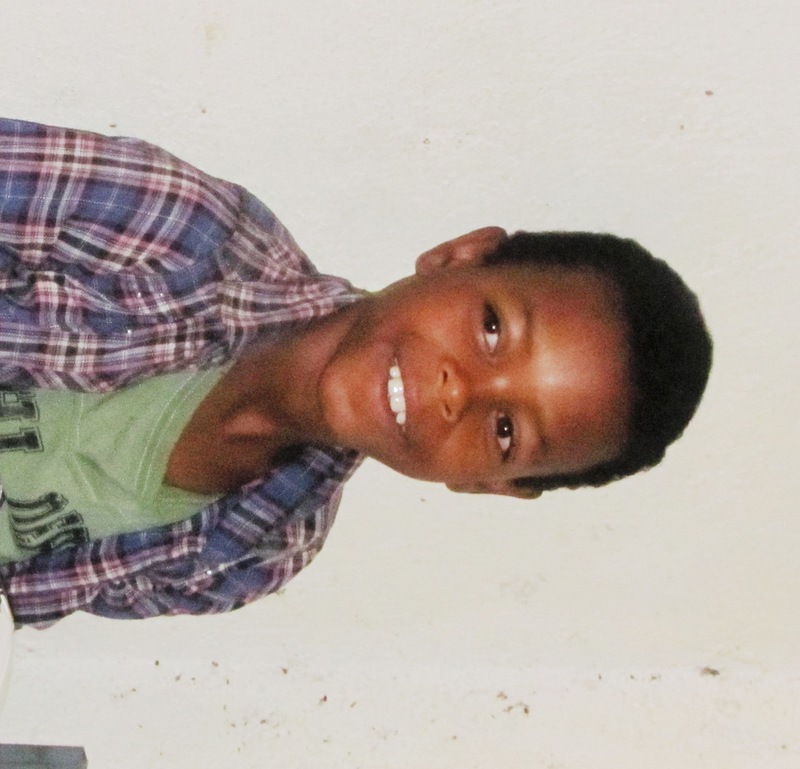 Solomon has two little brothers, Tekalign and Alemayehu, and a little sister, Sitota. 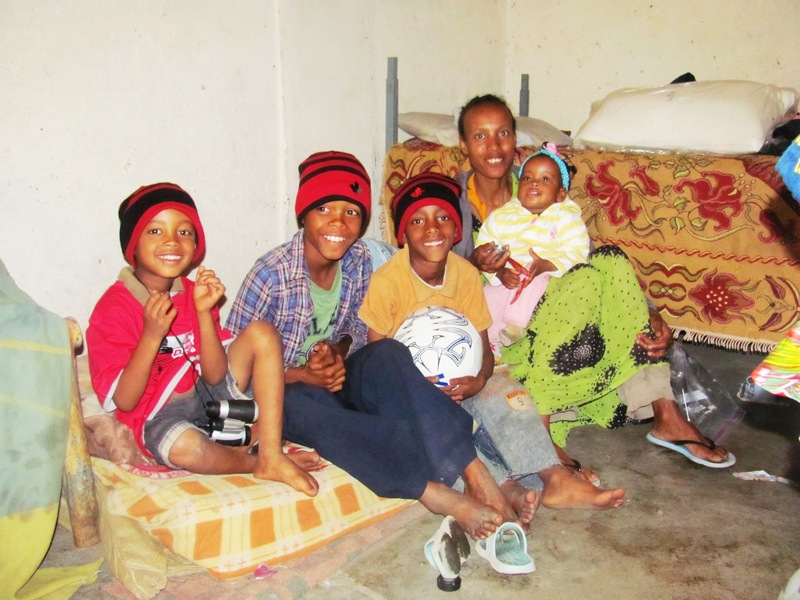 All four children are in the BCI sponsorship program but their family is still struggling. 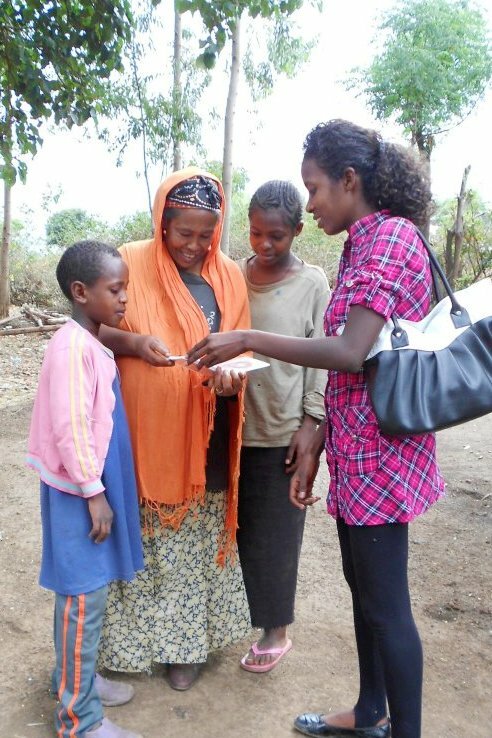 Tigist, Solomon’s mother, has HIV and is regularly sick with TB. She is too weak to do any kind of work. Taking care of her children is the only work she is able to do. Solomon loves to play soccer with his brothers and neighbors. The family lives in government apartments so he has many neighbors to play with, which is good because he has the energy to burn!! When Solomon and his brothers are in the house you can often find them sitting on the bed playing and giggling. Solomon loves his brothers very much. He is still not sure about his little sister, though. He helps his mom care for her but he says that she doesn’t do anything! This precious family solely relies on BCI to survive. They have no family that helps them. The family receives the basic grain support from BCI and the baby gets milk from BCI but they need more. Solomon currently is only being sponsored at $30 a month. A full BCI sponsorship is $90 a month. Even though Solomon is in the BCI program with one sponsor, two more sponsors need to be found so BCI can increase his level of care. Please visit www.blessingthechildren.org for more information on how to sponsor Solomon. Sponsors are able to communicate with their sponsored children so you have the wonderful opportunity of getting to know this sweet child and to have a hand in his care. Appearances can be deceptive. Take a moment to think of a time when you may have seen a person and immediately drawn a conclusion about them that turned out to be completely off. Maybe you saw a large, gruff looking man with a grizzly beard and enormous hands. You may have thought he was mean and unapproachable but upon speaking to him, found out that he was a kind, genuine man – a big teddy bear! Upon meeting people for the first time, it is normal to draw conclusions based on their appearance. Take for instance a young man named Henok that I met on my last trip to Debre Zeyit. I walked into a very dimly lit room and there lying on a disheveled bed was a young man whose head was too large for his body, his legs were atrophied and shriveled and his arms stilted in their movement. Although he had many physical disabilities, that didn’t stop his warm greeting and the kindness that beamed from his face. As his story unfolded, he was not the broken person I first imagined. Henok was born a healthy baby boy and brought much joy to his mother and brothers. Henok’s fortunes turned at the age of six months when his head became enlarged due to a fluid buildup. His mother took him to a doctor where surgery was scheduled to put a shunt in the base of his head to help the fluid drain into the spinal column. The operation was not successful to the point of curing his condition; but it certainly reduced the amount of fluid buildup. Due to his young age he was unable to learn to crawl or walk because he did not have the muscle strength to hold up his head. Over the years he has lost the use of his legs and his arms have limited mobility. As time progressed Henok’s dedicated mother took it upon herself to carry her 17 year old son to kindergarten everyday to try and provide an education for him. Twice a day she would make the trek to school with this precious burden on her back. This was between doing all her chores such as making meals, washing dishes, milking the cow, doing laundry, cleaning the house, shopping and many other numerous jobs. After a time, the strenuousness of the journey to school twice a day took a toll on her back and she had to give up taking Henok to school. Missionaries came to visit him one day and realized that a wheelchair would make his life easier to bear so they provided one to him. When I examined the wheelchair during my visit, I found it to be in very poor working condition – worn out from years of use, traveling over the rough ground. Upon assessing Henok we learned what his mother already knew… although his physical body is weak and distorted, his mind is capable of learning and developing. Henok remembers his colors and alphabet from kindergarten and is able to communicate in his native tongue Amharic. He is a sweet-spirited young man who loves the Lord with all his heart. 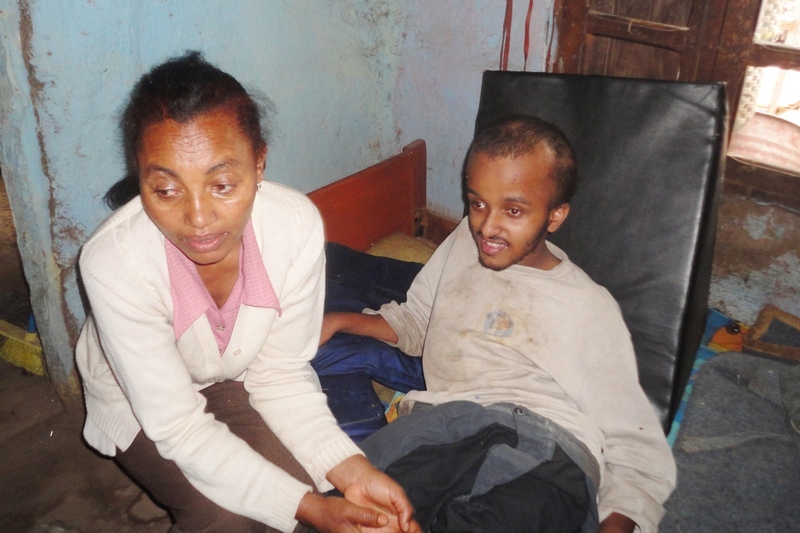 Because of his age and special needs, the BCI sponsorship program would not benefit Henok in the ways that he needs. But we believe every child deserves a chance, which is why we are asking for people to step forward and help BCI change Henok’s life. 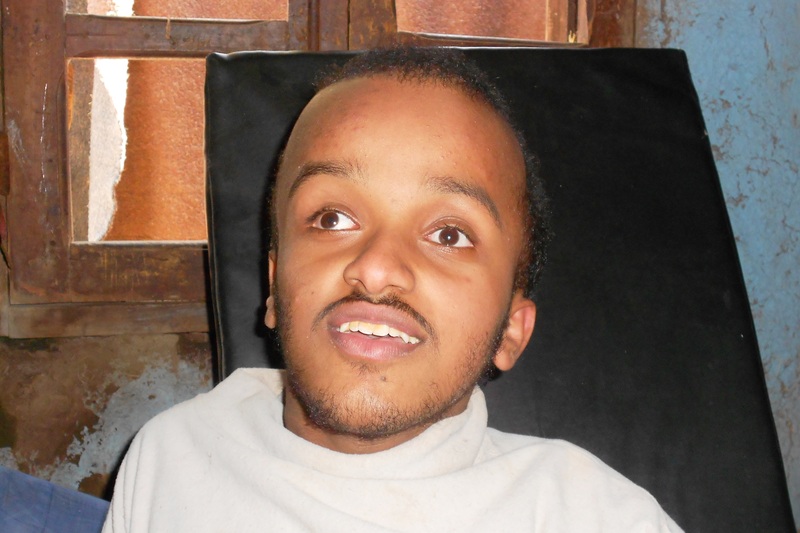 Henok needs a new wheelchair, a physical therapist and a tutor for schooling. The cost of a good quality wheelchair to withstand the wear and tear of travel in Ethiopia is $600. A tutor will be $75/month for a total of $750/year. A physical therapist will be $85/month for a total of $1020/year. We cannot do this without you! Would you prayerfully consider making a one-time donation towards the cost of a new wheelchair for Henok or contribute to the monthly cost of improving the quality of Henok’s life through a personal tutor and physical therapist? Please contact the Blessing the Children office by phone at 1-888-269-2719 or via email at Melissa@blessingthechildren.org. We praise God for the changes we already see in Henok and pray God will bless the efforts in changing this young man’s life. Will you partner with us in this life changing intervention? 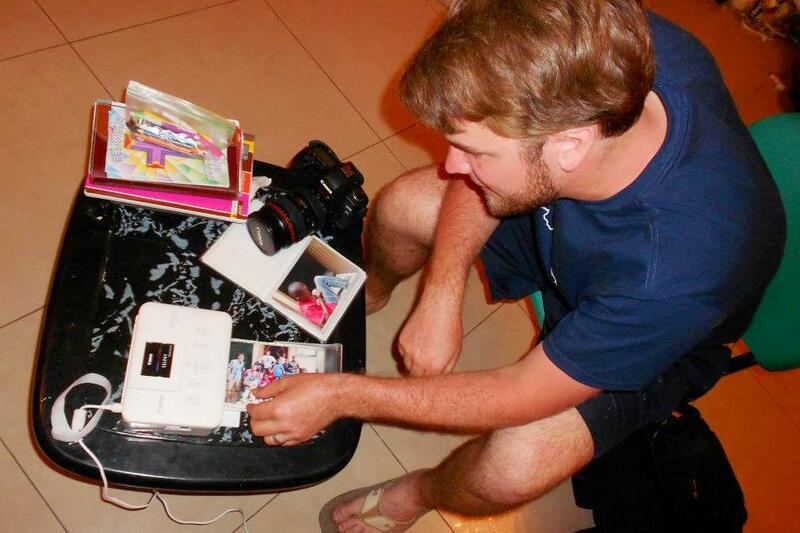 Will printing pictures for the families of Debre Zeyit, Ethiopia. Most Americans have hundreds, if not thousands, of undeveloped pictures stored on their computers, photo-sharing websites, or even on rolls of film. But imagine if you had absolutely no pictures of you or your family. No pictures of your children smiling, no pictures of their first steps, no pictures of your wedding day. Hard to imagine, isn’t it? However, this is the reality for a lot of our BCI families. Will and Robin Arnold, short-term missionaries from Illinois, recognized this as a problem for most Ethiopian families and they decided to help. Will and Robin came to visit BCI in June and they brought with them a unique way of serving our families. Will just recently graduated with a Master’s degree in photography and he wanted to use his skills in a valuable way on his mission’s trip. 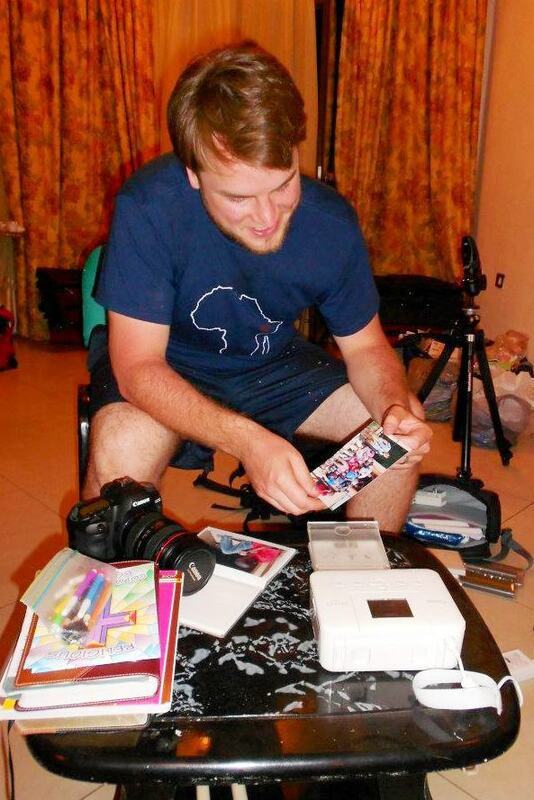 After thinking about the best way to utilize his skills he decided that he would take pictures of the families that he visited and present them with a photo book filled with pictures of the family. Alemayhu Abera & family looking through their picture book. 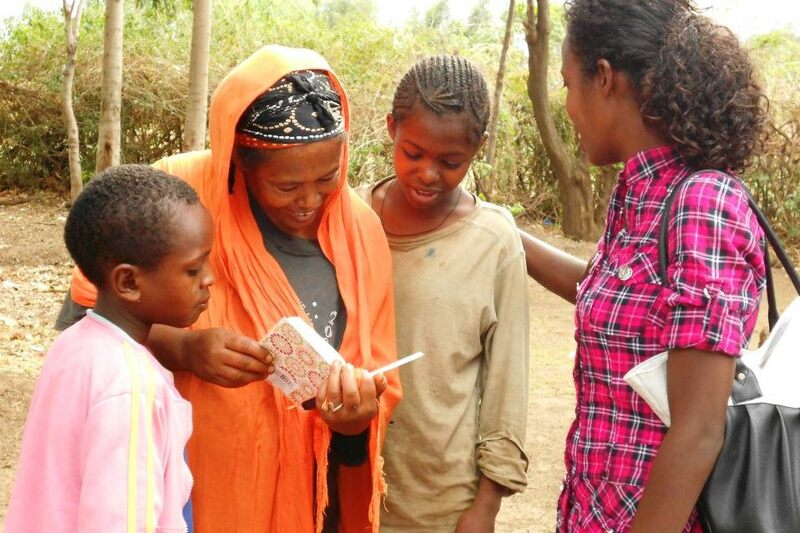 They came to Debre Zeit equipped with a photo printer that a friend of theirs let them borrow and approximately 30 photo books. After each home visit Will and Robin printed the pictures at the BCI guest house, filled the photo books with the pictures, and gave them to the social workers to give to the family. The families were so happy to receive this gift. They were amazed at the quality of the photos they received. They were delighted that Will was able to capture such amazing pictures of their family-pictures that showed the personalities of each family member. These photo books are a pricless gift that the families will treasure forever. There are many ways to serve the families of BCI but the best way is to use the gifts that God has given you. Thank you Will and Robin for blessing our families with your gifts! Thank you Will & Robin!